Much as we love to sail and hate to motor, weather guru John Martin warned us to be prepared to motor 2-3 days out of our 1,000+ mile ocean passage to New Zealand from Tonga. 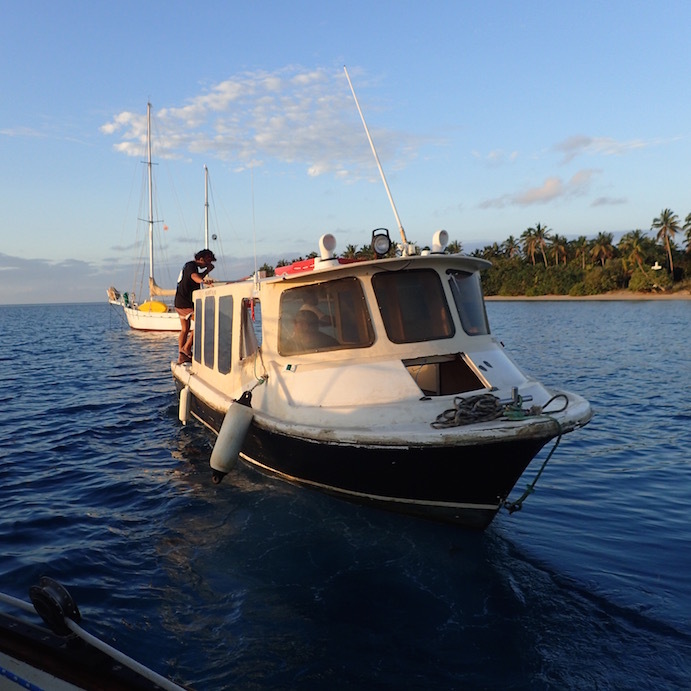 After not getting enough diesel for our passage from Galapagos to the French Marquesas and getting towed into Hiva Oa the last few miles in the dark, we wanted to avoid repeating that experience. 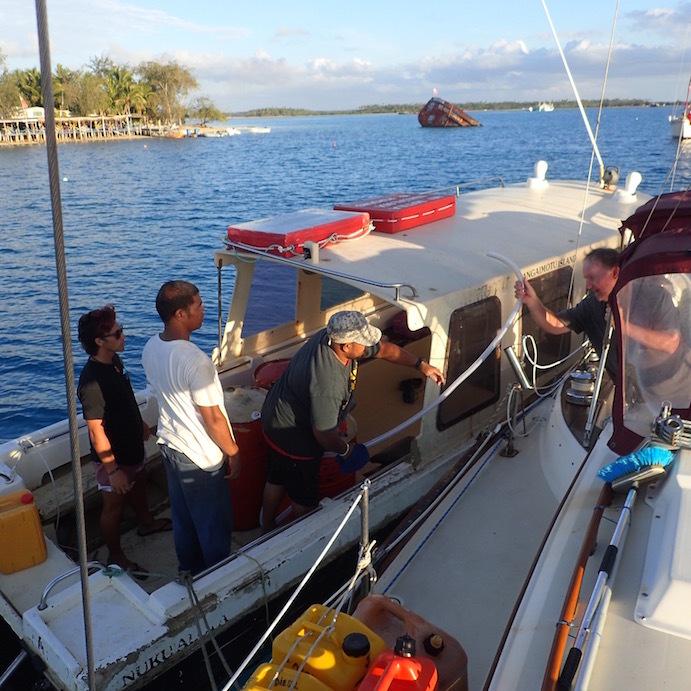 Our mishap was due to a mix of badly tattered sails, dying winds and a motor that refused to start due to too little diesel which turned to goo in our 37 year old fuel tank. A humbling end to our 3,200 mile passage. We can’t be certain our sails will complete this next passage with flying colors, but we at least wanted to make sure our fuel’s fully topped off. 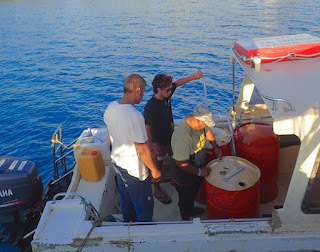 Plus, the duty-free diesel price for yachts checking out of Tonga is roughly $3.30/gallon USD including the extra cost of having it arranged from Big Mama’s Yacht Club and delivered directly to our boat. Pearson 365 sailboat. Pangiamotu, Tonga. 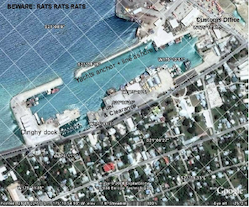 Otherwise, rumor has it to get duty-free fuel at Nuku’alofa’s tall, rough rat-infested cement dock is a colossal hassle. “Rats. Rats. Rats.” Warns “Mr. John’s Guide to Tonga,” among other cruising resources. We’re not sure how much extra we paid – perhaps $50 – for the clean convenience of receiving fuel at our boat. 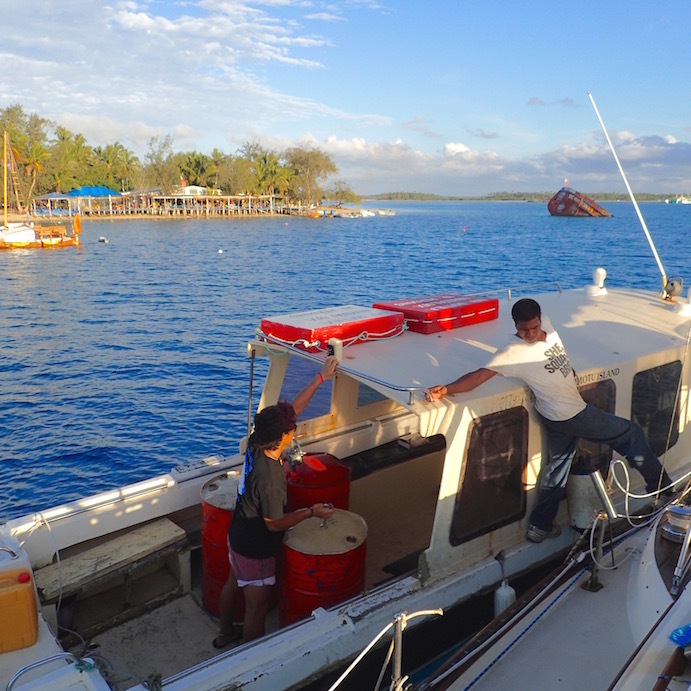 Especially after we saw Nuku’alofa’s fuel dock, we decided it was worth it. anchored near Big Mama’s just outside Nuku’alofa, Tonga. The minimum duty-free fuel purchase is 200 liters (3.7 liters/gallon = 54 gallons) minimum. The cost was 360 painga, which roughly converts to $180 USD, or $3.33/gallon. Topping our tanks took a little less than 40 gallons, or $132 USD; the remainder of the 200 liters, about 15 gallons, went to our friends on Armagh, also readying to cruise the same New Zealand passage. Even if we didn’t use much fuel on our passage, we heard diesel is substantially more expensive in New Zealand. We figured “worst case” we could use it cruising the Bay of Islands our first month in New Zealand, before we house-sit for about three months. and jerry cans. Near Nuku’alofa, Tonga. To get duty-free fuel requires checking out of the country and providing the duty-free paperwork provided by customs upon request. Theoretically, you’re required to leave the country within 24 hours of check out. As “luck” would have it, we heard the optimal weather window for leaving was on the upcoming Sunday and Monday. However, Saturday check-out cost ~$50 USD overtime. Nor were there any diesel available on Saturday, Sunday or Monday, which turns out was a holiday, Tonga’s “Coronation Day.” Tuesday deliveries would at soonest arrive in the afternoon. We opted to go renegade. 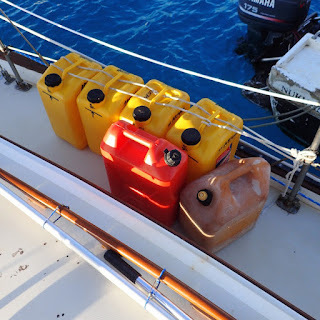 Check out on Friday morning – knowing full well our plans were to leave beyond the “24 hour” checkout -- and hope like heck everything went smoothly with the fuel delivery to our boat via Big Mama’s Yacht Club the same day. We were reasonably sure no one from customs planned to spend their three-day holiday weekend busting tardy cruisers who didn’t leave on time and surer still Big Mama’s wouldn’t “out” her paying customers. Besides, the primary reason we weren’t leaving within 24 hours also had to do with weather. Even customs knows it’s not ok to punish a cruiser for holding off exiting a safe harbor because the weather conditions were unsafe for sailing. required for acquiring duty-free fueling. As soon as we got our check-out paperwork including our duty-free fuel permit, Wayne dinghied back solo the 1.4 miles from Nuku’alofa back to Big Mama’s in heavy chop. Meanwhile, Steve and Patty from Armagh and I proceeded to complete the rest of our official Tonga checkout (more on that in a future post). Wayne would return later to meet us for a final provisioning run before we all returned to our boats together. Fuel ferry pulling away, finished right around sunset. As the sun cast its golden glow before dipping below the horizon, our fuel delivery arrived. Whew! We were their last delivery stop until Tuesday afternoon. 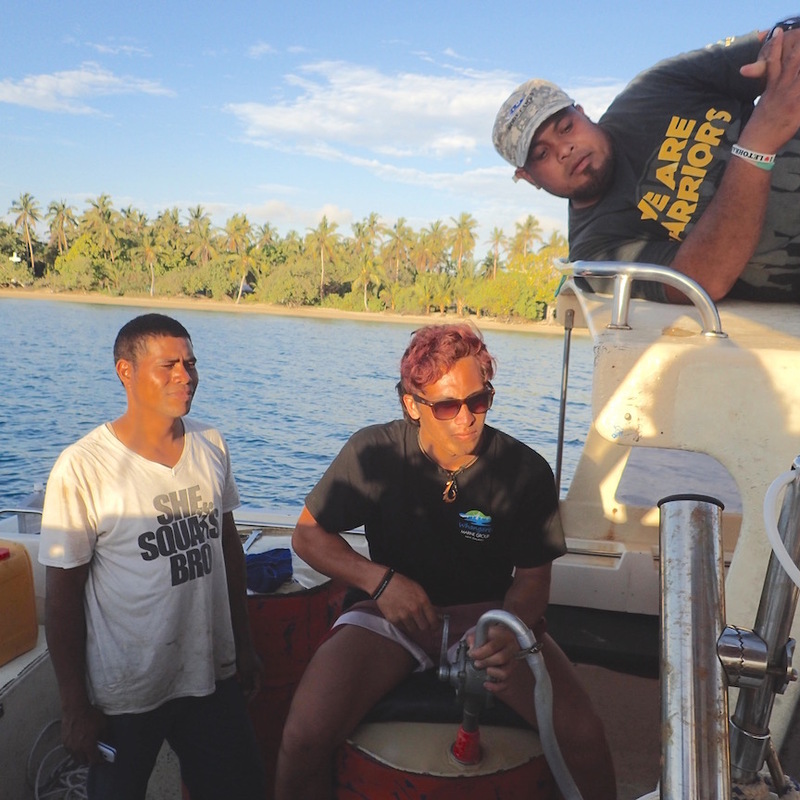 We’d heard from Paul of s/v Georgia Tonga’s fuel was surprisingly clean (“dirty” fuel can clog an engine, which requires a cool down and calm conditions to clean the fuel for the engine to restart). Still, Wayne asked if he needed to filter the fuel (using our Baja filter) prior to putting it into our tank. Yes, he was advised, though we all knew that meant it would take longer for us to complete our fueling process. We’d waited a while for the fuel. At the same time, we also knew it made a long day even longer for the fellows on the ferry. 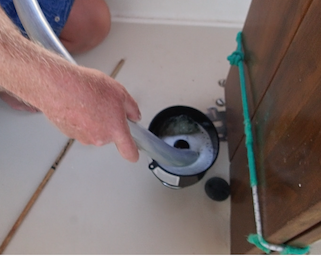 Wayne filtered the fuel, which like it was for s/v Georgia, clean. Still, better safe than sorry. We were ready, more or less. Now all we needed to do was wait for the right weather window for sailing conditions. Ideally that meant enough wind (not much more or less than 10-15 knots) in the right direction (not on our “nose”) to at least get us to Minerva Reef – ~257 miles -- in daylight hours with a minimum of motoring. We then needed similar conditions to get from Minerva Reef to Opua New Zealand – another ~830 miles. In fact, in less than three (24/7) days, we motored over 17 hours from Tonga’s Nuku’alofa to arrive at Minerva Reef and anchor there by daylight (separate post upcoming on our Nuku’alofa to Minerva Reef passage lowlights). We estimate that burned about 9 gallons. We motored just under 45 hours from Minerva Reef to Opua (normally we burn .6 gallons/hour, more this time due to some slight fuel leaks). Traveling 1600 miles over eight months through 13 island countries in our first year of cruising (with many stops – not just two), we used less 60 gallons of fuel.